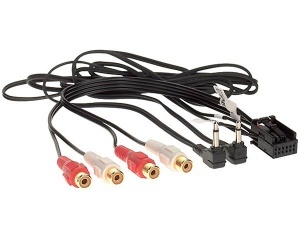 Audi AUX input adapters and aux cables for Audi A2 A3 A4 A6 A8 TT etc. Connect iPod, iPhone, iPad, MP3 players and more via RCA phono or 3.5mm jack lead and play the audio via your Audi factory fitted car stereo. Suitable for Audi models with Concert, Symphony, Chorus and 5.6" Navi Plus factory fitted car stereo models. 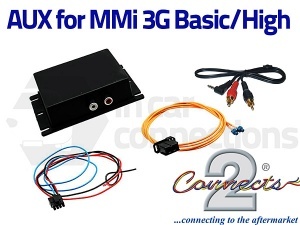 Audi AUX input interface for Audi models with the MMi 3G Basic or High system found in A5 A6 A7 A8 Q5 Q7 etc. The adapter plugs inline with the MOST fibre optic ring which enables a high quality audio input through the original Audi stereo and speakers. 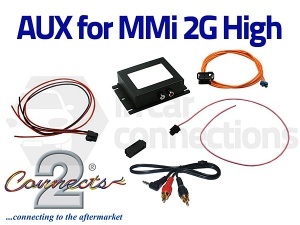 Audi AUX input interface for Audi models with the MMi 2G High system found in Audi A5 A6 S6 A8 Q7 etc. The adapter plugs inline with the MOST fibre optic ring which enables a high quality audio input through the original Audi stereo and speakers. Audi AUX adapter for Audi A2 A3 A4 and TT. Connect any iPod, iPhone, mobile phone, MP3 player etc. to the factory fitted OEM radio in your Audi. For 2006 onwards models with Quadlock CD changer connector. Full details inside. Audi AUX adapter for Audi A2 A3 A4 A6 A8 and TT. Connect any iPod, iPhone, mobile phone, MP3 player etc. to the factory fitted OEM radio in your Audi. Suitable for earlier Audi models (approx pre 2005) with Mini-ISO CD changer connector. Full details inside. 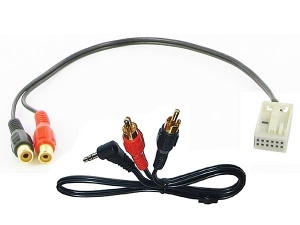 Audi aux input adapter lead for Audi A2 A3 A4 A6 A8 and TT. Connect any iPod, iPhone, mobile phone, MP3 player etc. to the factory fitted OEM radio in your Audi. 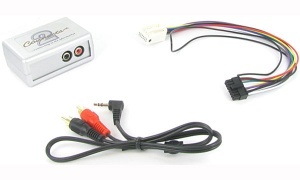 For Audi models 1997 - 2004 with Navigation Plus head-unit with Quadlock plug on the rear and AUX button. Full details inside. Audi aux adapter for Audi A2 A3 A4 and TT. Connect any iPod, iPhone, mobile phone, MP3 player etc. to the factory fitted OEM radio in your Audi. For Audi models 2006 onwards with Aux enabled radio (must have enabled AUX option) and Quadlock connector at the rear. Full details inside.